The Bridge on the River Kwai is one of the classic movies Netflix Instant added in June. The classic movie selections on Netflix Instant aren't exactly overflowing these days, but the online streaming service did add two wonderful films in June that are well worth watching. 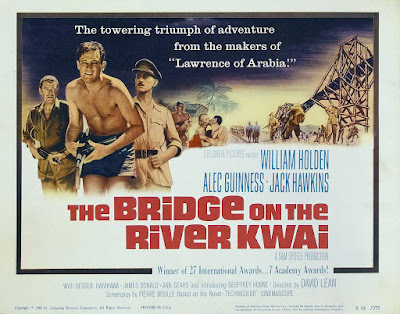 The Bridge on the River Kwai (1957): Director David Lean's World War II epic about a group of British soldiers in a Japanese prisoner of war camp features a great star turn from William Holden, but it is the battle of the wills between Japanese commander Sessue Hayakawa and British officer Alec Guinness that makes this film so riveting. Guinness deservedly won the best actor Academy Award, and Hayakawa probably should have won as well (He was nominated for best supporting actor but lost to Red Buttons in Sayonara). The Hustler (1961): Paul Newman was never better than in this Robert Rossen-directed drama about a small-time pool player who is trying to hit it big via a winner take all game against a billiards legend (Jackie Gleason). The pool game between Newman and Gleason is one of the great moments in sixties cinema; the rest of the movie isn't nearly as good, but George C. Scott still turns in a remarkable performance as Newman's Machiavellian manager. Years ago a World War II veteran told me that in his opinion, "The Bridge on the River Kwai" was "the best damned war movie ever made." Of course Pierre Boule's novel was even better. Not to give anything away, but the ending in the book is a little different from the film. But by all means see the film first. The Hustler: Fast Eddie v. Minnesota Fats. When the film was made Jackie Gleason was famous for his comedic role as Ralph Kramden in the TV show "The Honeymooners". His dramatic performance in the film was completely against type, except that he seems so at ease around a pool table. And don't forget that in 1961 there was a famous hustler called "New York Fats", one Rudoplf Wanderone. After the film was released, he decided that he would take the "Minnesota Fats" moniker, even though he was from New York and had never been to Minnesota. Jackie Gleason wasn't from Minnesota either, but he Minnesota fats has a better ring to it than New York Fats for some reason.